Yes, the Vera socks still fit! Yea! And, as promised, here is an update. It’s hard at this time of year to get a decent pic anywhere in my house under natural light. Since I’m on the north side of a hill, I get direct natural light for only a little while in the late afternoon during the winter months. This first picture of the tops of both socks is a bit dark. You can see that, even though the colors tried valiantly to pool over the instep, there’s still enough variation in the shades and in the stitch pattern to lend interest and keep it from being one big glob of the exact same tint. That makes this what might be the quintessential Lorna’s Laces pattern! 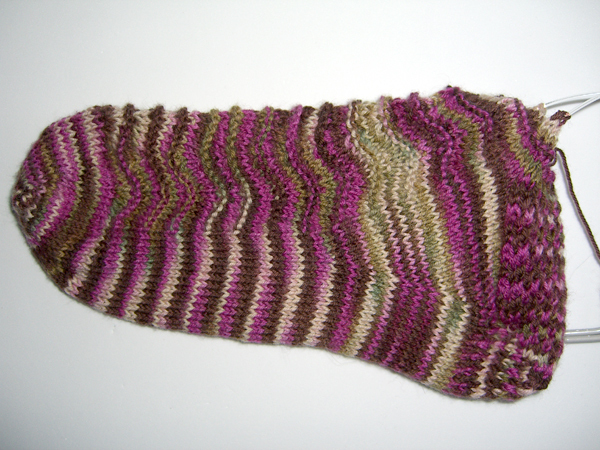 I decided that an Eye Of Partridge heel would look best with this pattern. The colors in the yarn made a nice sort of checked or speckled look that fits in well with the “grandma’s old afghan” look of the wavy stitch pattern. This side view is the top sock from the picture above. 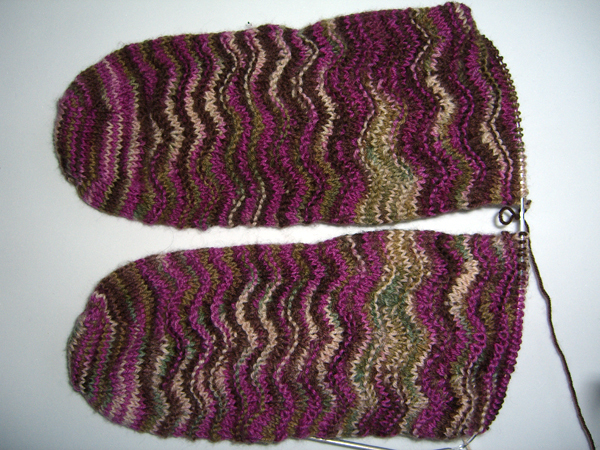 This gives you a closer look at the pseudo-pooling on the instep. As always, click on the pictures to get a bigger view in a pop-up. Lorna’s Laces Shepherd Sock in colorway Vera. Inox size US#2 needles (double circs). The 20,000th visit to PI occurred this morning. Someone from right here in Portland popped in for an early-morning look-see. I know… I’m easily amused.